It’s not easy managing a newsletter and even the best of us fail in doing so. Email marketing can be a tricky mistress to handle, and today we’re providing you with 4 reasons why your emails never get opened. 1.You have just won $100,000,000. Claim your prize now! The first thing people see when you send them an email is the subject line, this is your one chance to draw them in. Write a subject line that looks spammy, is un-engaging or simply boring is the best way to make your open rate hit the ground faster than a one-winged pigeon. Remedy: Ensure your subject lines are either provocative, exclusive or negative. The idea is to create a reaction inside the recipient and to give them a compelling reason to open. Accordingly to Mailchimp, certain words placed in the subject header will greatly reduce your open rate; they are help, percent off, and reminder. If you’re a marketer who loves sending emails that never get opened, carry on using these words. Remedy: Be more creative. The buzz words listed are done to death, think outside the box not only get more opens, but avoid the spam filters – or worse, the BlackHole! Bad example: How I can help you gain more subscribers for your list! How many times have you received an email and even after reading the “sender” line, you still have no idea who they are? A great way to ensure even fewer of your emails actually get opened is to write something mysterious or better yet misleading. We advise going with the name Prince Toure Okonko to get your open rate into single digits. Remedy: On the other hand, if you do want people to read your emails, make your information as clear as possible. The sender line should stay consistent throughout all your emails, and instantly point out who you are. If your sender line does not achieve this, change it. Some people couldn’t tell a story if they were handed a book to read. Not everybody can write compelling content that engages readers and interests them to read on, and that’s fine, writing engaging content is very difficult indeed. If you’re a really bad story teller, lack proper grammar skills or have no idea how to engage your audience, by all means – continue to write all your own newsletters to ensure your emails go straight in the spam box. Remedy: Hire a professional! There are thousands of freelance writers that can be found on several websites who can write all the content for you, allowing you to concrete on your strengths. Hiring a persuasive writer can make a huge difference to your open rate. All joking aside everybody wants their emails opened! Otherwise, why bother sending them? At SaneBox, we’ve created the email marketer’s worst nightmare and consumer’s best friend – one of our most popular features, the one-click unsubscribe. Simply drag the email into the SaneBlackHole and that sender is blocked FOREVER. 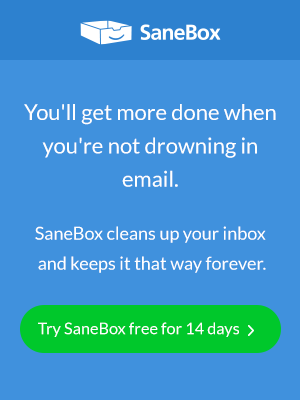 If any of your subscribers are using SaneBox and they think your emails are junk, with just one click they can trash them. Follow our advice to ensure your emails never end up in the BlackHole! I was not knowing about that there is a feature that we can send a email that will never open so the information given by you is useful for us.